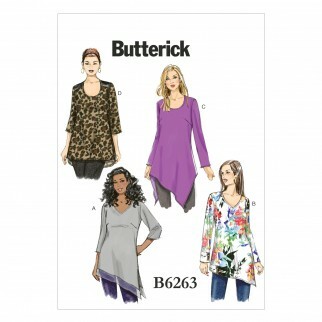 Pullover tunic (semi fitted through bust) has neck and hemline variations, and narrow hem. A: Hem band. A and B: Left side slit. D: Applied yokes, back longer than front, and side slits. C and D: Wrong side shows on hemline. Suggested fabrics are; Crepes, Challis, Georgette, Broadcloth, Peachskin.